Traditional and reinvented afternoon teas, served with 5 star panache. 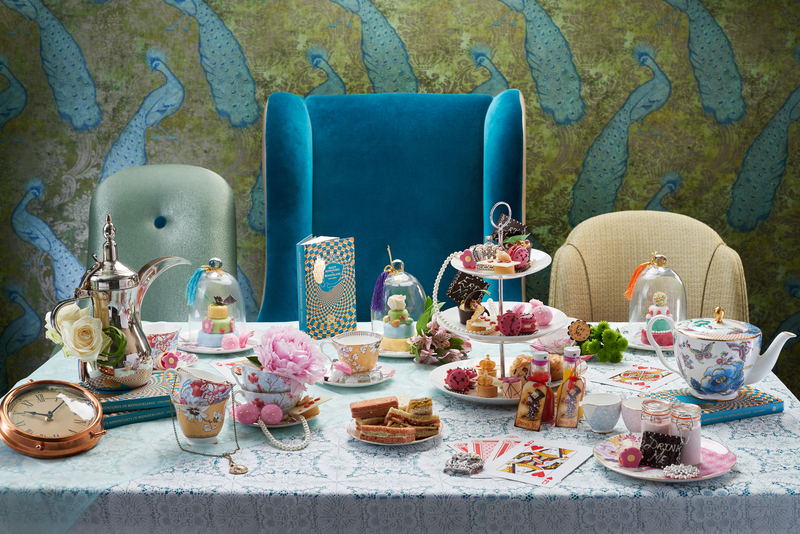 Follow Alice down the rabbit hole and enjoy an Afternoon Tea in Wonderland. 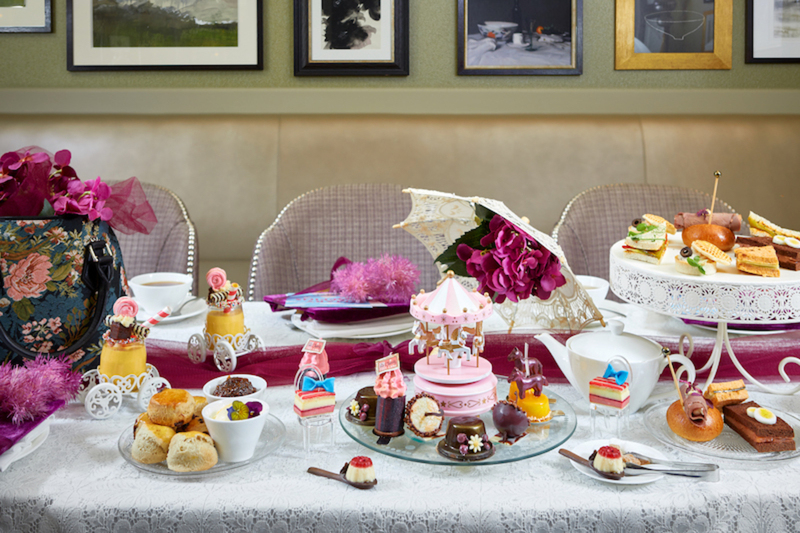 Fantastical, elegant and fun - this very special themed afternoon tea will have you grinning like a Cheshire Cat. The Tea Party in Wonderland features an eclectic menu of cakes and pastries inspired by characters and quirks from Alice’s Adventures in Wonderland like ‘Queen of Hearts’ Mango Tarts, ‘Drink Me’ strawberry potion, ‘Caterpillar’s Mushroom’ Raspberry Marshmallows, White Chocolate Mousse Teacups and Pocket Watch macaroons. Accompanying finger sandwiches include Alice English Cucumber and Cream Cheese on Beetroot Bread, Fish Footman Tuna Mayonnaise on White Bread and Lory Cornish Yarg and Tomato with Redcurrant Jelly. £40 per person during the week and £45 on weekends. Due to popular demand, a vegetarian menu option is also available. Please see the link below. Guests looking for a memento or an exclusive gift can also acquire their very own hardback copy of the 150th Anniversary celebration edition of Alice’s Adventures in Wonderland for a supplement of £12. Commissioned as part of the 'English Classics, Reinvented' literary series, this collector’s edition was launched at the preview reception of the Hay Festival 2015 at Kona. The unique cover is East London based designer Ethan McClean’s psychedelic interpretation of Alice’s journey down the rabbit hole - an illustration capturing Alice's journey from our world into Wonderland, where she falls into the abstract, in an optical illusion which hypnotically pulls the reader into a strange new land. Welcome one and all to a tasting trip of a lifetime. Hop on board the Candy Striped Carousel for a multitude of treats and an expertly created selection of cakes and goodies. The delectable menu is much more than just a short spin on the local Ferris wheel. 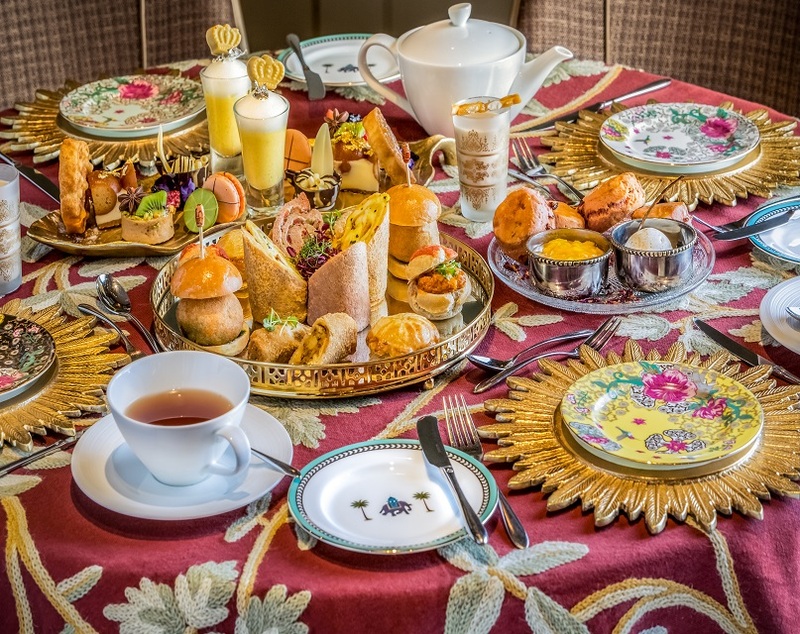 It includes joyful surprises such as The Spinning Top, a delicious banana and passion fruit compote on chocolate sphere or the Egg and Spoon, a mini strawberry and rose-flavoured cheesecake on a decorative mock-chocolate spoon alongside traditional British sandwiches and scones with a twist! You’ll be singing and dancing with glee as you leave our enchanted fair ground and hit the London pavements at the end of a delightful afternoon! £40 per person during the week and £45 on weekends. Vegetarian menu option also available. Candy Striped Carousel Afternoon Tea must be booked at least 24 hours in advance. Our Jasmine Indian Afternoon Tea evokes the rich traditions of the Indian dining culture with a bold and innovative twist on the traditional afternoon tea. From the chaiwallah road side tea stalls scattered throughout India right up to the splendour of the residences of the Maharajahs; enjoying tea is a uniform and unifying presence in an extremely diverse country. The Jasmine Indian Afternoon Tea menu’s beautiful selection has been crafted to reflect just that, using traditional spices from across India. Enjoy a variety of sandwiches such as spiced creamed cheese, kachumbar pinwheel in beetroot bread and savoury Eastern dishes such as crispy chicken tikka spring rolls. Follow with the traditional Indian dessert Gulab Jamun; beautiful deep fried & sugar poached milk dumplings and a selection of delicious cakes, scones and pastries, including chocolate Rasmalai cups and Gulabi scones with kismis and almonds, served with mango compote and cinnamon clotted cream. Wash it down with a selection of eastern and western teas and coffees and a simply divine shot of salty caramel lassi with a chikki toffee crunch. The Jasmine Indian tea is £40 per person during the week and £45 on weekends. For reservations or other enquiries, please contact us at +44-20-79638391 or kona.london@tajhotels.com. Looking for a special gift that's a little bit different? How about treating your loved ones to one of our Afternoon Tea experiences with a special bespoke voucher, valid for six months and personalised to the recipient. For more information and to buy the vouchers then please email: kona.london@tajhotels.com. Please note that by clicking on the above link to book you will directed to ‘BookaTable’ which is a 3rd party website that has been partnered to provide free, secure and instantly confirmed online table reservations.